Soundiron LO is a dedicated Kick and Low Frequency FX library for the full version of Native Instruments Kontakt. It's designed for EDM, Glitch, Hybrid, Electronica, Hip Hop, Breakbeat and any other genre of music that calls for serious low end with a dynamic and unique flavor. Each sound has been carefully sculpted by sound designer Spencer Nunamaker of Juno VHS, with awesome detail and nuanced character. With 176 distinctive kicks in all flavors, tones and styles, 271 bass FX and 23 ambient bass synths, this library is an essential weapon in any producer's creative arsenal. From huge to tiny, from heavy to snappy, any flavor of hand-designed electronic kick you could want is in here. Lo is perfect for minimalist, EDM, IDM, dubstep, chillwave, glitch, post rock, soundtrack, downtempo, dub and ambient music. 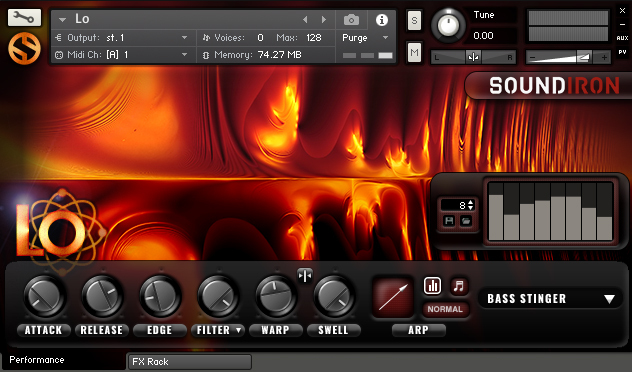 It's also fantastic for sci-fi sound design and creating user interface SFX for games and apps. 34 Kontakt 5.5.1 .nki preset banks. 34 Instrument Presets with dozens of selectable articulations, performance controls, filter, pitch warping, vibrato/ring mod, Arp sequencing and full FX rack. 176 distinctive sound-designed kick/bass drum sounds to choose from in 5 broad flavor categories. 271 bass stingers, boomers, drops, transitions, and other long low-end effect types in 8 categories. 23 ambient, atmospheric, tonal pad and environmental patches, with 1 master bank and 13 custom FX preset banks.